Janus statue on Boa Island, Lower Lough Erne. Irish Grid Reference: H 0851 6197. 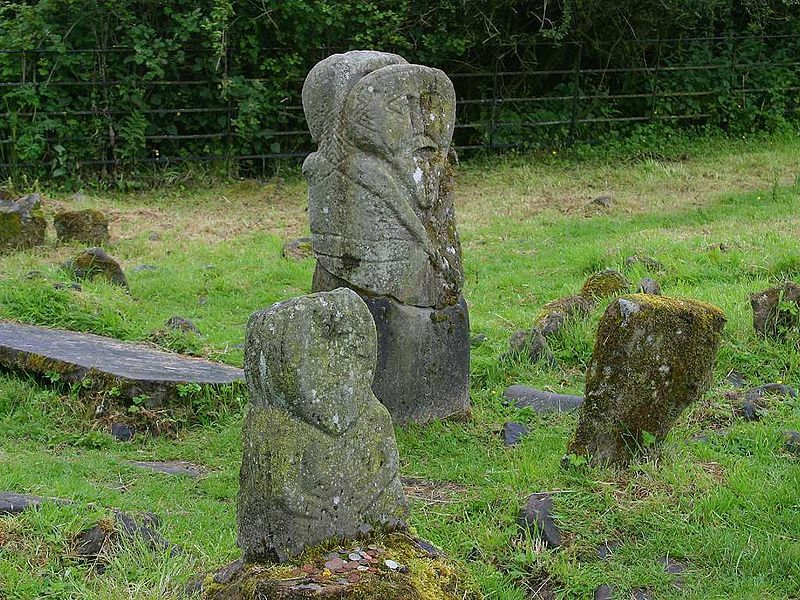 On Boa Island near Kesh in Lower Lough Erne, County Fermanagh, Northern Ireland, there are two curious statue stones with strange, unique carvings probably harking back to pre-history, or more likely the Roman period, and not as some historians once thought, the 5th or 6th century AD. 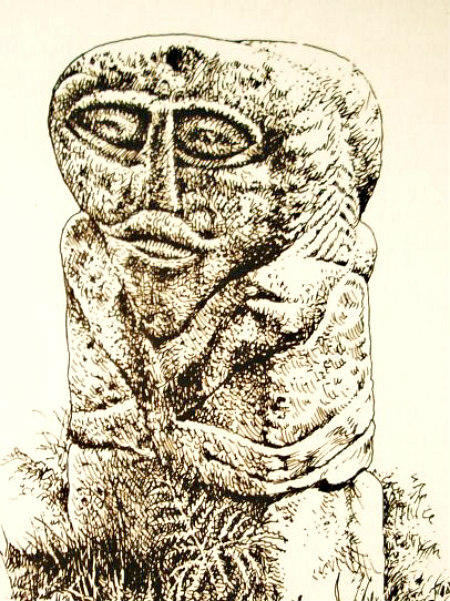 One of the stones is a double-headed carving which suggests it is a depiction of the Roman god Janus, whereas the other smaller stone known as the ‘Lusty Man’ is perhaps a depiction of some other pagan diety from the Iron Age or Celtic period; this particular stone idol originated on the nearby island of Lusty More. The stones are located in the Caldragh Cemetery where there also used to be some ruins of a church. To reach the site from Kesh head (north) on Pettigo Road, then (west) onto Boa Island Road (A47) and over the road bridge linking Boa Island. After a few miles (at the far end of the island) a lane heads (south) to the cemetery (signposted) which is close to some farm buildings. The site itself is on the first of the three small islands all of which are called ‘Boa Island’. The two Boa Island statue stones by Jon Sullivan (Wikimedia Commons). The two ancient statue stones stand together amongst more modern gravestones in Caldragh Cemetery on the island. They are blank-faced in their appearance and have strange, pear or heart-shaped faces, oval eyes, and folded arms along with other decorative carving including pattern-work and interlacing. The smaller statue ‘the Lusty Man’ has only one good eye – the other is not properly carved. This could, in fact, be a female diety. It is 2½ feet high, while the other is just under 4 feet high and both are of local sandstone. However, the damaged and broken bases they stand on seem to be unrelated to the actual statues even though they have similar carvings. The double-headed Janus-type statue is bilateral (male and female). So could this female figure perhaps be a representation of the Celtic goddess Babhbha (Badh or Badb), who has given her name to Boa Island (Inis Badhbha). The Janus stone has a shallow depression at the top and a phallic symbol. Many scholars are now of the opinion that they date from the Iron Age. Bord, Janet & Colin, Mysterious Britain, Paladin Books, London, 1984. Matthews, John & Caitlin, The Aquarian Guide To — British And Irish Mythology, The Aquarian Press, Wellingborough, Northants, 1988. Nicholson Guide, Guide To Ireland, Robert Nicholson Publications Limited, London, 1983. Sharkey, John, Celtic Mysteries — The Ancient Religion, Thames And Hudson, London, 1981. The Rough Guide, Ireland, (Fifth Edition), Rough Guides Ltd., London, 1999. Categories: Statue Stones | Tags: Boa Island Statue Stones on Lower Lough Erne in Co. Fermanagh Northern Ireland | Permalink.